Bruce MacAulay Thomas was born in Melbourne in 1937, and attended Scotch College (1950-55), and the University of Melbourne (1956-64). There he gained a First-Class Honours Bachelor of Engineering degree in communications engineering, continuing in postgraduate work to gain a Master of Engineering Science and Doctor of Philosophy in the field of antennas. He joined the CSIRO Division of Radiophysics in Sydney in 1964. From 1964 to 1978, he was involved in antenna research relating mainly to the Parkes radiotelescope. From 1978 to 1994, he was responsible for leading the research and development efforts relating to earth-station antennas for satellite communications, including interaction with industry. From 1975 to 2000, he contributed to the technical discussions of the International Telecommunications Union (ITU), and represented Australia at meetings in Geneva and other cities. He initiated an Australian ITU Study Group on radio communication propagation and was responsible for organising an international meeting of the ITU Working Party in Adelaide in 1993. In 1987, Bruce received a Doctor of Engineering degree from the University of Melbourne for his research work, the title of the thesis being: ‘Contributions to the realisation and development of circular-aperture hybrid-mode corrugated horns and their application to radiotelescopes and earth-station antennas’. He was promoted to Chief Research Scientist in 1993. In 1994, he transferred to CSIRO’s Australia Telescope National Facility, where he made contributions to commercial issues and antenna design. From 1994 to 1996, he was CSIRO’s project manager for an extensive upgrade of the Parkes radiotelescope including provision for rapid receiver/feed-system changes for radio astronomy use and to meet the requirements of a contract with NASA for tracking in the Galileo mission to Jupiter (described in Thomas BM, Schafer JT, Sinclair MW, Kesteven MJ, Hall PJ, 1997, ‘The Parkes Radio Telescope modified for rapid receiver changes’, IEEE Antennas and Propagation Magazine,39: 54-63]. From 1996 to 2002, he took a leading role in the search for a radio-quiet site for the next-generation radiotelescope called the ‘SKA’. (The Square Kilometre Array is a concept of an array of small radiotelescopes with a total collecting area of one square kilometre.) This role required discussions with many parties including state government departments. Based on this search and associated discussions, an advisory committee has recommended an inland area in Western Australia as being an appropriate site for the SKA. Bruce retired from CSIRO in 2002. 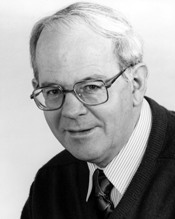 In 1989, Bruce instigated the NSW IEEE (combined) Chapter of Antennas and Propagation, and, Microwave Theory and Techniques, and was appointed Chairman from 1989 to 1991. He was a member of the NSW IEEE Section Committee from 1989 to 1995. Thomas BM, 2010, Personal communication.